Mark Gault Company specializes in custom home building, remodels, commercial properties, and tenant finish out projects. Additionally, our company also has extensive experience in detection and repair of the water intrusion issues that cause leaky rotten stucco homes. 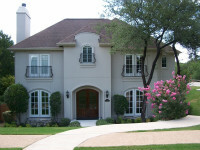 Mark Gault is a leading consultant on water intrusion damage and repair in Central Texas. At Mark Gault Company, we can provide you with the full scope of stucco services, including: casual "walk-around" consultations, water intrusion testing, estimates of repair, complete repair, and assistance in recovery of repair cost. Mark Gault Company also offers expert witness testimony in water intrusion related litigation. Our company embodies the best aspects of Austin, Texas. It is a local, family owned business that delivers personalized customer service with the highest quality construction on the market. Mark Gault Company sets itself above competitors by focusing on quality, not quantity. Each project is personally overseen by an experienced jobsite superintendent, whose attention to detail ensures that the operation stays within the estimated cost, is completed in a timely manner, and is done right the first time. For over 20 years, Mark Gault has built an honest, respected reputation by providing customers with superior construction at the best value. From concept to completion, we keep an open door of communication with our customers and subcontractors to make sure the customer is satisfied with every step of the construction process. If you own or are buying a stucco home, and suspect there could be damage due to water intrusion, please check out our frequently asked questions page and our leaky rotten stucco page. Give us a call today at 512-328-2233 to schedule an appointment!